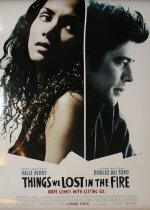 Things We Lost in the Fire Movie Hope comes with letting go. Things We Lost in the Fire release date was Friday, October 19, 2007. A woman is widowed when her husband dies suddenly, leaving her alone with two children. She decides to invite her husband's troubled best friend to live with them and, as the friend turns his life around, he helps the fractured family confront the emotional void left by the loss.